1. MAC Lightsweep Shadester Sculpt and Shape Powder- very fine, smooth, and buttery on the skin. Bronzing/contouring powder is a straightforward brown, more taupe than the usual orange tinged bronzers. While the highlighter has no shimmer at all. Best for sombre contouring and classic makeup. 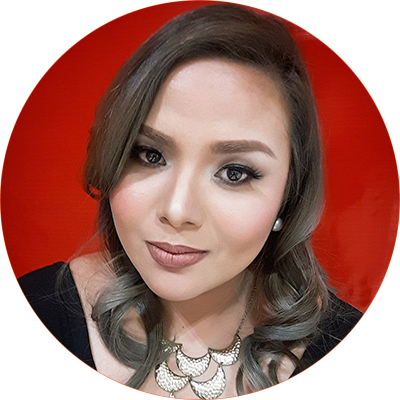 Highlighter and contouring powder are both matte and color payoff is subtle but buildable. Great for basic motds and stays put all day. It retails for about 26 dollars and is currently the priciest contour item I have. I only use this for my classic motds that have a serious all-matte vibe to them. 2. 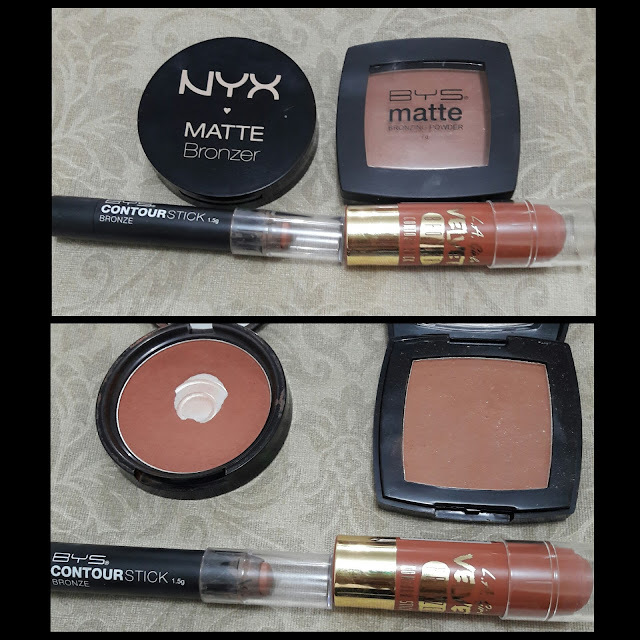 NYX Matte Bronzer, BYS Matte Bronzing Powder, BYS Contour Stick and L.A. 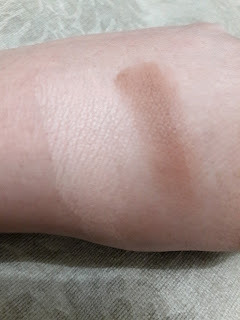 Girl Velvet Bronzer Contour Stick- with each product under 10 dollars, and basically classified as drugstore brands, you'd be surprised how great they actually are at the contouring game. The NYX matte bronzer in dark tan is actually one of the first bronzers I've ever gotten for myself and I still love it to this day. I actually hit pan already. The color payoff is great, texture is smooth, it has a teeny bit of orange which requires a light hand during application but not an oompa loompa level of orange. I find that it works well with dark or tanned skin. BYS matte bronzing powder is a present fave because it is a dark taupe without any orange tinge. It is the darkest of the bunch. 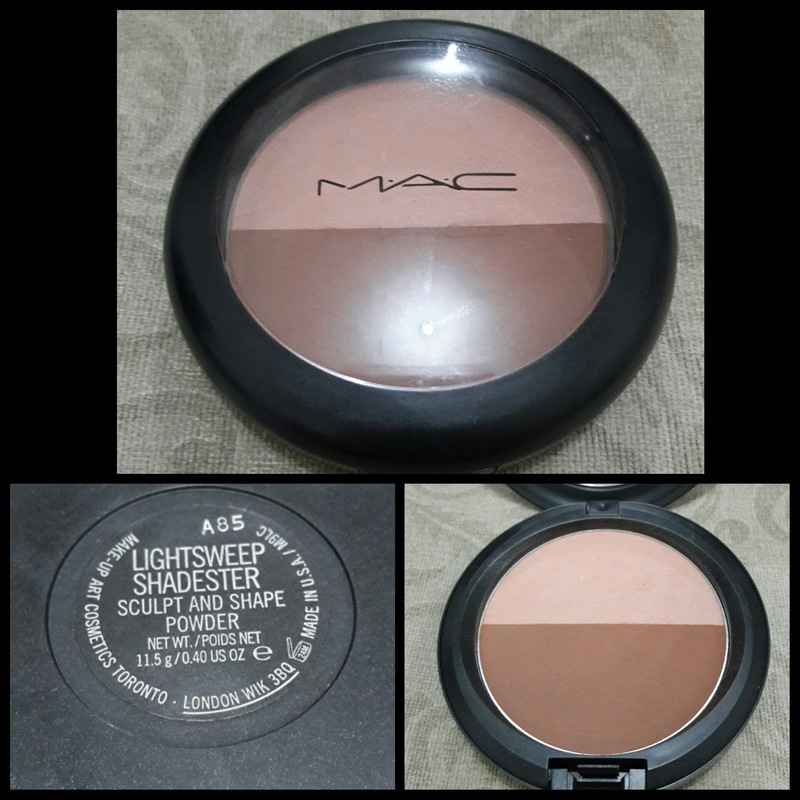 I usually use it on top of cream bronzers to set the contouring. 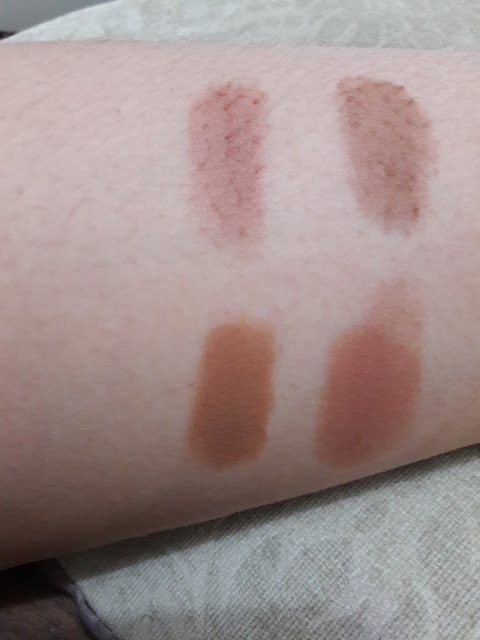 BYS Contour Stick is what I prefer to use on my noseline. The pointed tip gives the same taupe shade I like in its powder counterpart and lets me get a thin precise line with a swipe. The BYS powder and cream stick really work well together. LA Girl Contour stick is probably the most orangey of all. Great for a sunkissed effect on the cheek but not so much for daily contouring. I find the tip too rounded and thick to get a precise line. I would recommend using a smaller blusher brush with it and I prefer to use it only on my cheeks because this does create an oompa loompa effect. One thing to remember about these cream sticks, they WILL budge if you don't set them. 3. L.A. 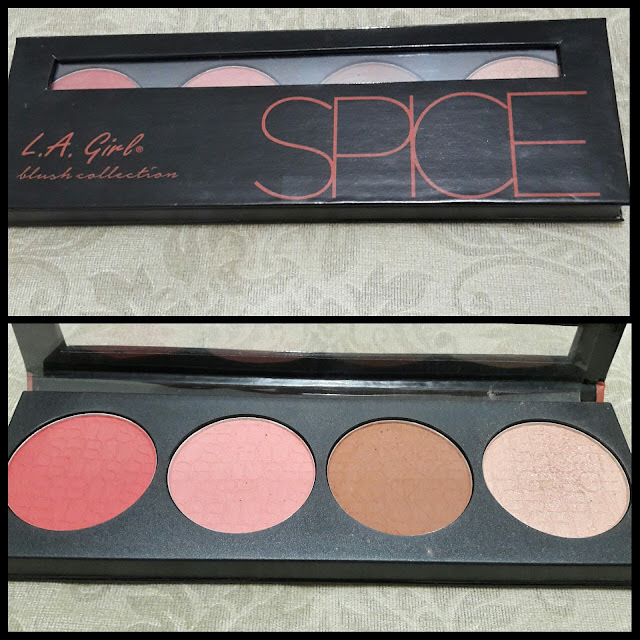 Girl Spice Palette- this palette is a real steal because you get 2 blushes, 1 bronzer, and one highlighter for 10 dollars more or less. 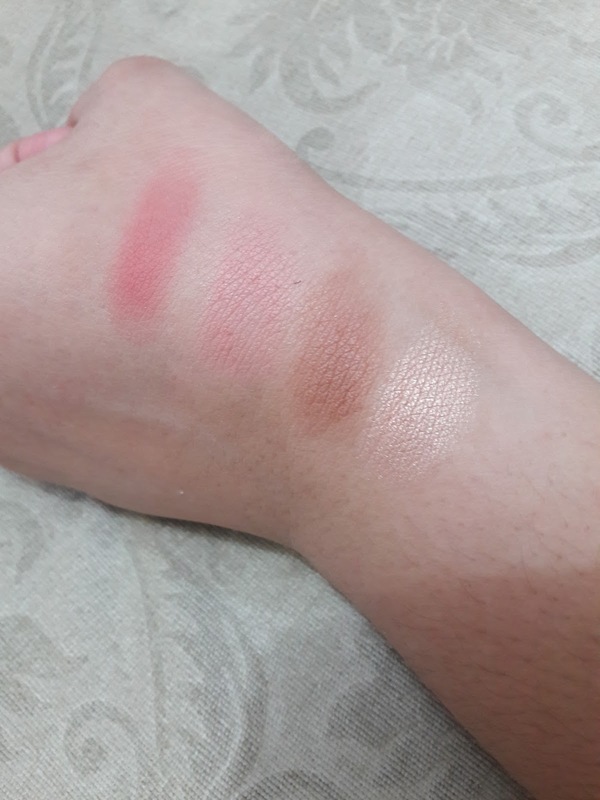 The blushes and the bronzer are very pigmented and apply quite smoothly, but the highlighter is not as finely milled as I would actually want. If you're not going to be using a lot of it, it's fine but don't go overboard and be all disco ball shiny with it because it can look oily, chalky, and streaky. You need a light hand with this stuff. That being said, the bronzer and blushes more than make up for the highlighter and I certainly like the looks I am able to create with this palette. I would recommend priming and setting your motd if you use it because it does disappear or go patchy if you don't.